M & W Contractors is a full-service design-build general contractor serving the agricultural and chemical processing industries. 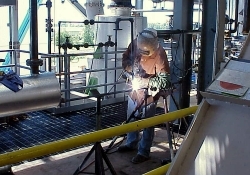 We specialize in mechanical systems, including pipe fabrication and process equipment. We also self-perform many aspects of each project, including excavation, concrete and steel erection. We are a company with a laser-like focus on serving our customers. Our clients are typically large, commodity-based companies that process grains into consumer products. 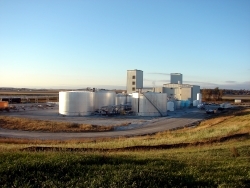 Our portfolio is packed with successes serving the ethanol, biodiesel, soybean oil extraction and refining industries. M & W Contractors was founded in 1982 to serve the construction and maintenance needs of biofuel, oilseed and chemical processing firms in the Midwest. 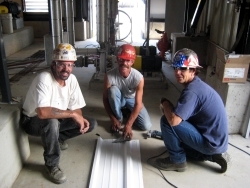 Back then, the projects we took on were primarily small plant expansion or shutdown work. But times change. And so has M & W.
Today, M & W continues to build on our superior reputation as a leader in the construction of oilseed processing and biofuel facilities. Further, as a full-service design/build general contractor, we have taken on numerous large greenfield and facility expansion projects. We've also branched out and embraced the remarkable changes taking place in the renewable fuels industry. Whether it's examining a customer's Process Safety Management (PSM) activities prior to a scheduled plant shutdown—or determining how our construction schedule will impact traffic flow at the site—our highly trained staff's first priority is your satisfaction. M & W Contractors believes that safety must never be sacrificed when completing a work task. For that reason, we are committed to providing a safe and healthy worksite for all of our employees—and our customers' employees. We accomplish this through proactive planning, both formal and informal training and careful coordination between M & W employees and our customers' employees. We take a proactive approach to worksite safety, including detailed task planning and hazard recognition. Before beginning each new task, the assigned work crew reviews the steps involved and considers potential hazards. Then, as a team, the crew develops and implements a solution to eliminate or control those hazards. M & W believes safety is a skill that, when supported by employee training and management leadership, results in a continuous learning mindset in our employees. To ensure our employees' safety, they receive training to help them better recognize the potential hazards of their work and the proper steps they can take to eliminate or control those hazards. Training is conducted in accordance with applicable federal, state and local regulations, and is constantly updated to reflect changes in our industry. In addition to formal training, weekly "Toolbox Safety" meetings and ad-hoc new task planning sessions also provide employees with the opportunity to address safety concerns, receive new information and be reminded of our constant commitment to worksite safety. To meet each customer's unique safety requirements, customization and communication is key. As a team, M & W Contractors' safety coordinator and the customer's safety representatives collaborate to ensure M & W employees receive the appropriate orientation and training required to work in the facility. Often the training is conducted onsite. The overarching goal is to tailor a site-specific safety program that meets the needs of our customers and employees.